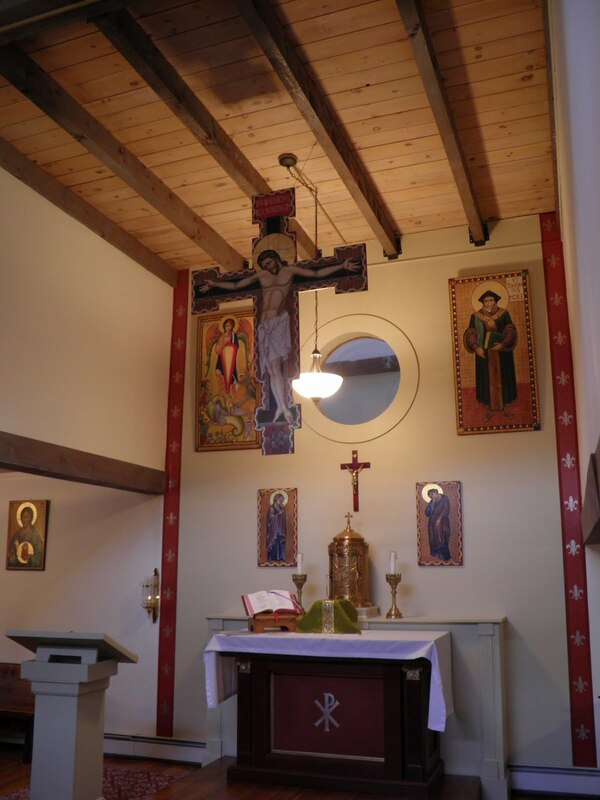 (Merrimack, New Hampshire)—Students of Thomas More College returned from their Christmas recess to an exciting surprise—a beautifully transformed chapel. While the students were home with their families, Thomas More College’s staff and faculty joined together to install a new altar, polish and position the tabernacle in the center, unveil three new icons, buff pews, wax floors, and tastefully paint and frame the sanctuary space. The new mahogany altar is placed to ensure that the priest be Ad Orientem during both the Extraordinary and Ordinary Forms of the Mass. On the front is painted the traditional symbol of the chi rho, the first two Greek letters of ‘Christ’, emphasizing the symbolic representation of the altar as the body of Christ. On the back wall hang four icons, painted by the College’s artist-in-residence, Professor David Clayton. Three of these icons were installed just this week: Our Lady, St. John the Evangelist, and St. Thomas More. 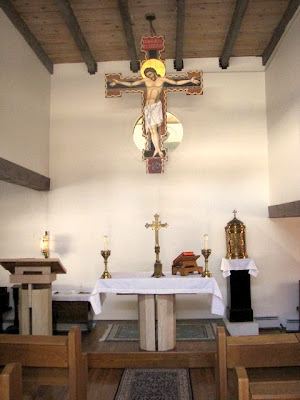 The icons of Our Lady and Saint John—the traditional figures shown at the cross—appear at the foot of the large hanging crucifix, even though it is suspended ten feet from the wall on which the icons hang. The icons are seemingly connected to the crucifix due to the complementary color schemes, matching borders, and careful positioning. 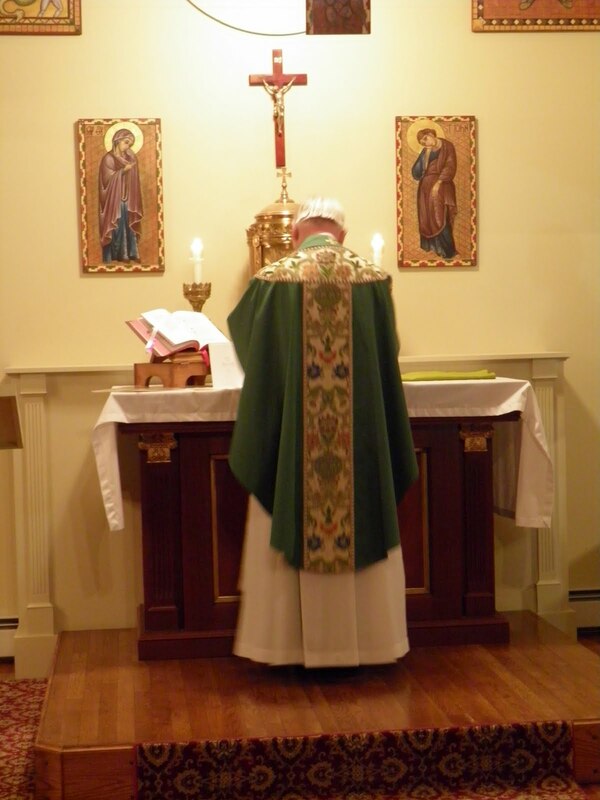 Interestingly, the unique placement of these icons also causes them to appear at the foot of the smaller crucifix, which hangs on the back wall for the priest to view during Mass. The icon of Saint Michael the Archangel, unveiled last March, is now joined by a new icon of the College’s patron, Saint Thomas More. Both icons are five feet in height and two and a half feet width. They hang above the two smaller icons, while a fifth icon of the Sacred Heart, installed two years ago, hangs to the left above the bench where the priest sits during Mass. The space is bordered with Fleurs de Lis on a background of warm burgundy. The Fleur de Lis is a traditional symbol of both Our Lady and the Trinity. As a result, the space is marked apart from the rest of the room as being the sanctuary. Most important, changes made to the College’s chapel now allow the tabernacle to be situated in the center of the altar.